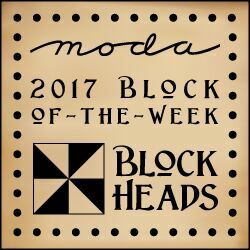 I think this is my favorite of the Moda Blockheads blocks so far, and of course it’s Lisa’s! Really nice block. A couple posts back about big stitch quilting. My fabric is all starched, do you big stitch quilt your quilts that have starched fabric? What template do you use for the baptist fan? Thanks so much Lisa, I’m a follower! I agree with your quilting perspective. I have a friend with a longarm quilting machine and she does beautiful work. I too would rather piece or do hand work. As a longarmer, I thank you for your perspective. This is a beautiful block! Oh my gosh, I totally understand…..don’t you just love Call The Midwives!!! So excited for the next season. I love Call the Midwife so I totally understand how you can get caught up in it. You posted your block, which I love, so no worries. Hi Lisa, a quick question, would you ever consider giving a class on line for the big stitch? There are so many of us that can never get to take that class, but would love to!! Such a gorgeous block. Love those fabrics. Lisa, I love that block. The fabrics look great together with that design. Like a burst of wind.. here you come and bring sunshine with you! Thanks, it’s a beauty! I can’t get this block to print from the blockheads page. I had that trouble with block 19 too. This one may be my favorite so far. Hope your husband is doing better.